Andy Warhol – A La Recherche Du Shoe Perdu (Shoes, Shoes, Shoes) portfolio contains 16 hand colored unbound sheets. 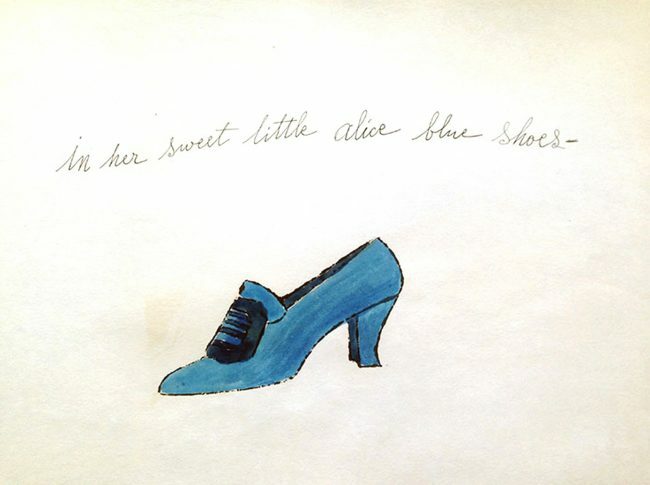 This portfolio of Shoes by Andy Warhol was created in collaboration with Ralph Pomeroy who wrote the accompanying poems. The lettering was done by Andy Warhol’s mother, Julia Warhola. Estimate $10,000- $15,000 USD. Andy Warhol loved to draw shoes—high heels, pumps, or jeweled stilettos—and they were among his first subjects when he worked as a young commercial fashion illustrator in 1950s New York. Later on, in 1980, once Warhol had achieved fame as an artist, he returned to portraying footwear. Although best known for his silkscreen paintings, Andy Warhol was also an excellent draughtsman. Drawing was a constant part of his artistic practice. Each of the sixteen images in this portfolio features a shoe centrally placed on the page accompanied by a simple line of text, a verbal-visual composition mimicking the picture and ad copy of advertisements. Each of the works in “A la Recherche du Shoe Perdu” were hand-colored. Andy Warhol’s mother helped developed the phrases that go along with each shoe.